A picture illicits a thousand words. Lessons will be more pleasant and memorable when pictures are used in place of direct translations, time-consuming explanations, bulky props, and ambiguous pantomimes. 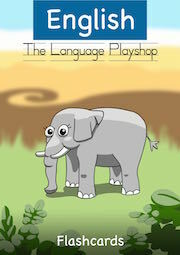 – The Language Playshop The set of flashcards can be used for all ages, and the worksheets are for children between 4 and 10. Yes, this is a shameless plug for my materials, and you should buy it all immediately! – Visual Grammar (Timesaver) This is by far the best grammar workbook for the teacher on the go. I’ve used it with kids as young as 10. Adults are fine with this material too, as long as you mix it in with other texts and activities.